We want to ensure that you get long-lasting satisfaction and pleasure from your GROHE fitting. Therefore, please read the following care instructions because damage to the surface and underlying material resulting from improper treatment is not covered by warranty. Do not use any abrasive sponges or scouring agents for cleaning. We also advise you not to use cleaning agents containing solvent or acid, limescale removers, household vinegar and cleaning agents with acetic acid in them. They are aggressive to the surface - and will leave your fitting dull and scratched. As the formulations of commercially available cleaning agents frequently change, we cannot guarantee they will provide the gentle care our fitting deserves. Clean the fitting with a little soap and a moist cloth only, then simply rinse off and wipe dry. You can avoid lime spots by drying the fitting each time it is used. If lime deposits do occur, remove them with GrohClean, our environment-friendly cleaning liquid. 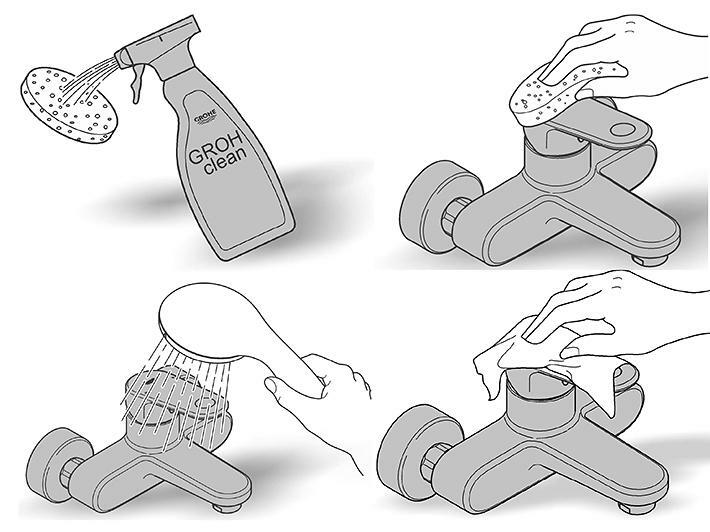 GrohClean is specially formulated to clean the surface of our fittings gently. GrohClean is available from your supplier.